It’s nearly summer. Hooray! If there’s anything I love more than the sun making an appearance, it’s being able to throw off the socks. Boots be gone, summer’s here and I’m cracking out the sandals. Mules, flip flops, reef sandals, I love em all. I love painting my toenails and feeling the air under my soles. Yes, summer truly is my favourite footwear season. Only, it’s not an easy season. 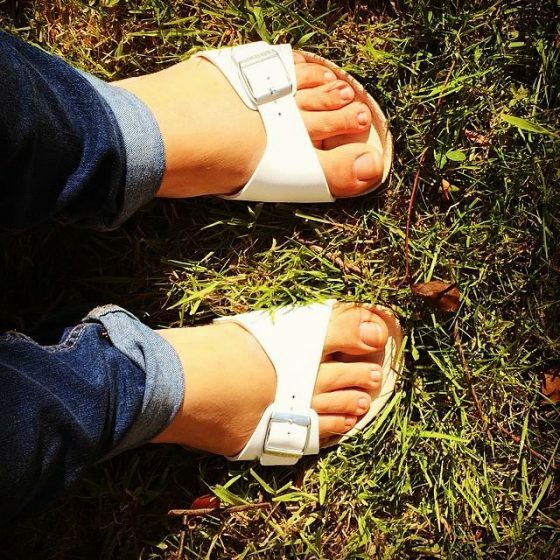 Every summer, since I’ve been able to afford them, I’ve worn Birkenstock single strap ‘Madrid’ mules. I love them. I love the look, I love that they go with anything, I love that you can just slip them on. I’ve owned several pairs over the years. My first were a rather natty silver, but since then every pair I’ve had has been white. Every year I think of moving onto a different colour and every year I can’t help but go back to the simplicity of the fresh looking, summery white. And yet every year, without fail, regardless of whether I’m wearing last year’s sandals or a box fresh pair, they give me blisters. Every summer, my poor big toes are shredded and the bridge of my foot has a 3 inch rub line. It’s to do in part with the fact that I pronate (roll in) when I walk. I know that. But it doesn’t stop me. I love them. So I just have to push on through. The summer starts in pain. Blisters and friction burns and spending more on plasters than the shoes! But eventually the skin toughens up. The blisters heal and I suddenly realise I can wear them without half a roll of micropore tape strapped to my feet and finally summer is truly under way. Until Autumn comes, the weather changes, and the socks go back on, undoing all that hard work. And next summer I know I’ll have to start all over again. Because despite the pain and the blisters and the fuss and the mess, I’m never going to give up my beloved sandals. Perhaps I should just buy shares in Elastoplast next summer? I’m already wearing my Birkenstocks this year! I know it doesn’t help for this year but in the weeks leading up to sandal season try rubbing surgical spirit over the areas that blister. It should harden the skin a little. Ooo I’ve not tried that. Thanks! Hahah good idea! I did that with my wedding shoes. Wore them round the office and at home for months before! Hahaha ‘fire ants between my toes’! I know that feeling! It’s the reason I veer away from rubber flip flops myself, although I did buy some Havanianas in an emergency last year and will be giving them another go this summer. Wish me luck! Oh I have a pair of those too and the tow thong ones, I’ve never had blisters from them though! But toe thongs can be uncomfy when you first start to wear them again. It’s like your toes have to toughen up for summer. You’re so lucky, you must have magic feet! I wish I did! What are we like? Tbh, I wish I lived somewhere I could wear them all year round. That would make me happy! Right? Unfortunately I’ve already got them! Silly me thought I could walk to preschool without it hurting!